Ironing 101 Tips. Salt. Cleans The Bottom Of Your Iron To Perfection. Some tips for ironing just knock you off your feet. Do you know the benefits of salt? According to the Himalayan Salt people. Regulates your blood pressure, in conjunction with water. Extracts excess acidity from your body’s cells, particularly the brain cells. Ironing 101 Tips. Which Kind Of Water To Use In Your Iron? First it was the low fat. Low salt diet. Which saw people dying of heart disease almost reduced by half. No one can deny that the low fat. Low salt diet. Really worked. Now it’s the safe fat diet. Where we’re told sugar and salt are the culprits. Which are added to foods that are low in fat. To make them palatable. That there’s now good fat. And bad fat. And it’s up to us to know the difference. We’re also told the sugar lobby is responsible for all the negative talk about. Fat. And we can’t deny how successful they are. At pointing the finger. At. FAT! Ironing 101 Tips. Hate Ironing? Not If You Have The Right Tools! Why is it that we think that a carpenter must have the sharpest saw? To make the best cuts? That a plumber without a pipe cutter can’t do his job. That a mechanic without sockets. Ratchets. And hex wrenches. Can’t work on your car. We give scant thought to what makes ironing pleasurable. Yes. Ironing. Pleasurable. In the same sentence. As with any skill. And ironing is a skill. It’s only a chore if you don’t have the right tools to transform it into a skill. Ironing 101 Tips. The More You Pay. The Better Your Iron Is. Much as we’d like to think so. Not all steam irons are equal. You’ve heard this before. And it’s true. This is the truth about cheap irons. Ironing 101 Tips. The Mesh On Your Ironing Board. Is It Telling You Something? There was a time when ironing boards lasted forever. From the time they were invented. Until the 1980’s. That’s when the ‘make everything in China’ syndrome infected every retailer. Who forced manufacturers to close down in Australia. And export Australian jobs to the making of everything in China. Because it was cheaper. And the retailers could make bigger profits. And the quality of just about everything has never been as good again. An ironing board made prior to 1970 was a lifetime acquisition. You only purchased one. Ever. Ironing 101 Tips. Does Your Iron Spit At You? Your iron does talk to you. It’s kind of like dogs. And cats. Rather than words. It uses body language in the form of signals. And sounds. That tell you what’s happening in the life of your iron. Is your steam iron spitting? Or maybe it’s leaking a tad bit? If this is an intermittent occurrence. It’s normal. Just as with all heating and cooling controls. The temperature goes up and down. To maintain control. Much like the radiator in your car. And the air conditioner in your home. Ironing Diva. Garment Care. Is It Time To Declutter? So You Iron Less Frequently? 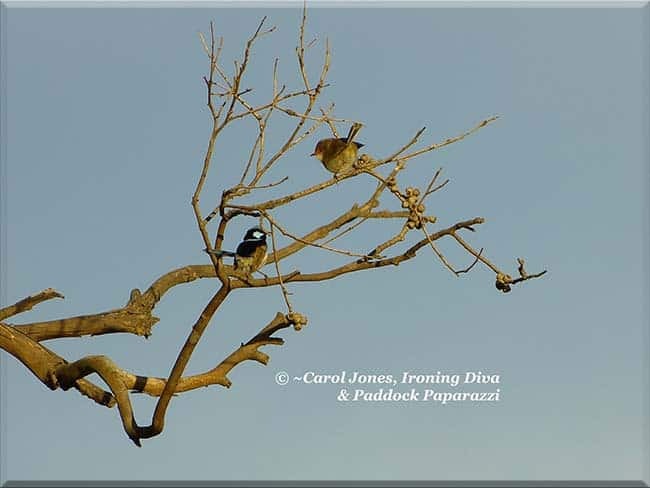 Superb Fairy Wrens. A Mating Pair. My modest farmhouse. Owner built by a Swiss National on a shoestring. Is 34 years old. And has wardrobes the size of postage stamps. If I was to iron my clothes for the week all at once. And put them in my wardrobe. I’d be ironing them again on the day I want to wear them. Because they would be wrinkled. And not wearable. Ironing 101 Tips. 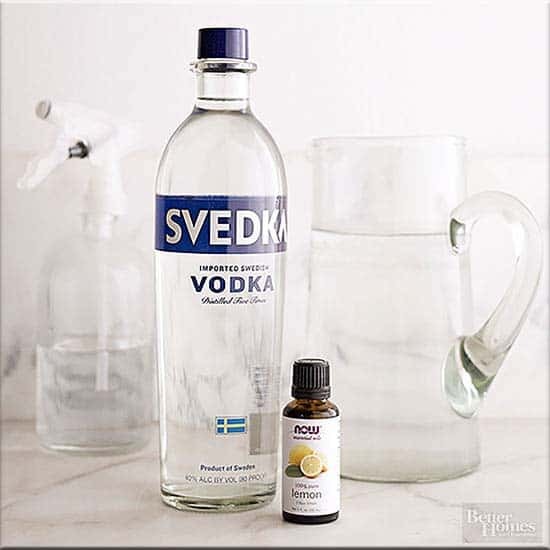 Vodka. For Cleaning. Not Just For Drinking. I always have a busy business day, running my worldwide business The Fitz Like A Glove™ Ironing Board Cover And Other Goodies. I live my life on the phone. And revel in the wonderment of some of the things I find online. My business has more than 350,000 customers. In 29 countries. So it stands to reason that if you have an iron. And an ironing board. Either with. Or without. A Fitz Like A Glove™ Ironing Board Cover. You live in a home. Whether it be free standing. Or an apartment. Even a caravan. That’s the nature of being alive. We cook. And the stove needs to be cleaned. Ironing 101 Tips. Glam Up Your Ironing Board. Our ironing board is more than 50 years old. A hand me down. 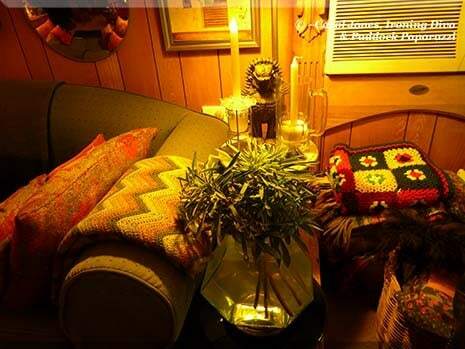 That was part of my partner, Victor Pleshev’s, dowry, when we made the decision in 1980 to live together as a couple. It’s sturdy. And of a quality that can no longer be purchased today. Having spent half its life in the salt air of Balmain. The legs became pitted. And damaged. As salt air does to all metal. And having spent the next half of its life on a dusty rural property. It became impossible to keep those white legs clean. 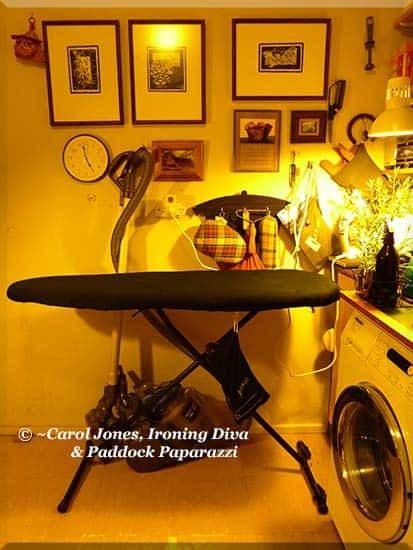 Having recently revamped my pantry, laundry and sewing alcove, I wanted a new look for my ironing board. 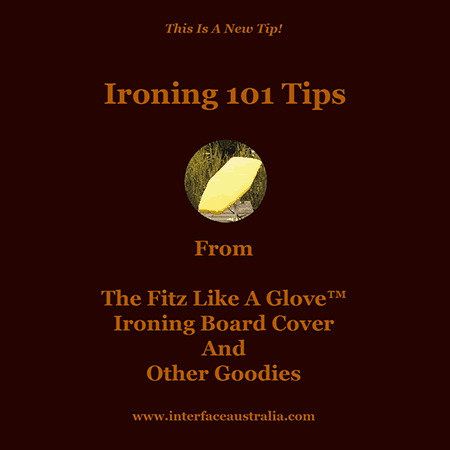 I’ve had an Ebony Fitz Like A Glove™ Ironing Board Cover on my board for many years. So the obvious choice of colour for the legs was . . .
. . . matt black. Today is Day One for the new black legs. Ironing 101 Tips. The Magical Cleaning Power Of Old Fashioned Borax. Running my worldwide business, The Fitz Like A Glove™ Ironing Board Cover And Other Goodies, from my remote rural property means I spend more time at my desk. And computer. Then I spend outdoors. And I do like to bring the outdoors. Indoors. Living on 54 hectares. And cultivating a hectare of garden. I don’t lack for greenery to bring indoors. When indoor greenery dresses up. And brightens. My farmhouse. In what can be grey and gloomy days in my hills. 970M up above sea level. My favourite greenery is the grey green, petal shaped leaves of the Euphorbia Characias perennial plant. Of which I have many. As they are prolific self seeders.